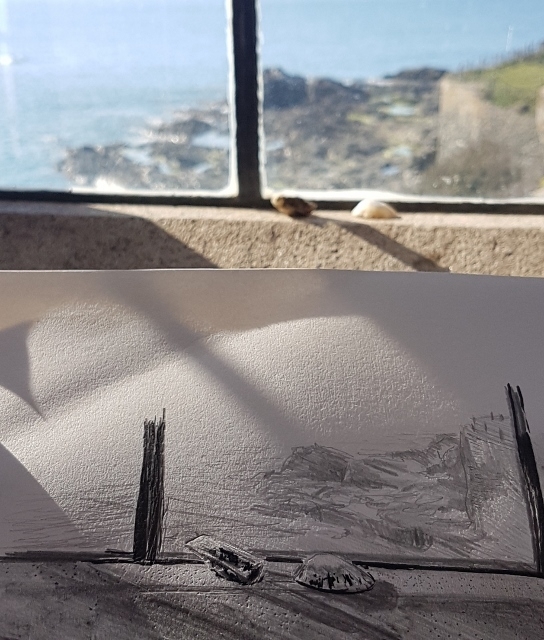 I’ve long wanted to have the opportunity to join several other women artists on a week long retreat at Prussia Cove and finally got an invitation from Jacqui to share a week with another girl Karen. I’d been there before and admired the timelessness of the secluded coves and the arts and crafts house nestled in under the cliffs. It’s now part of a larger holiday letting estate called Porth en ‘Alls and they have several properties to let including coastguard cottages. The house was pretty antiquated. An attempt to keep it’s authenticity and charm, but the cold bathrooms and lack of showers took a little getting used to. Anyway the weather was exceptional for the time of year and most of the time was spent outside either walking the coast path or just taking a cup of tea down onto the little beach early in the morning. It was solitude in nature and blissful. 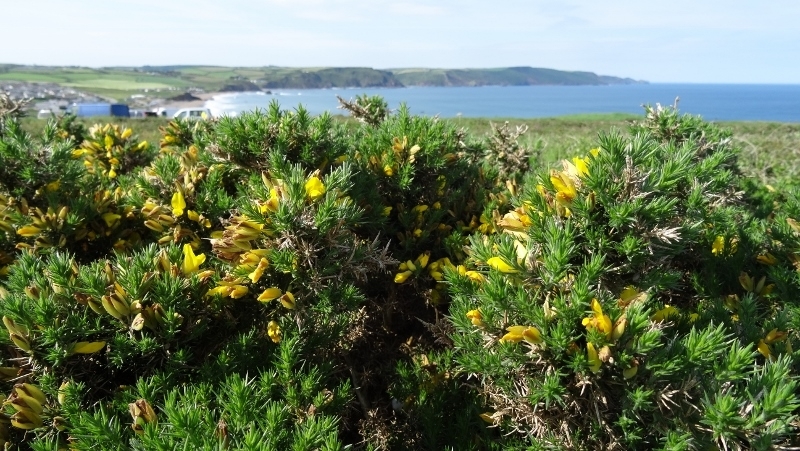 The liquid sunshine of Cornish gorse has filled my coastal journeys this Spring. The beautiful May coloured the coast a vivid yellow matched by my cadmium yellows dark and light and filtered into many of my new paintings. I usually make a cocktail to match the theme of my annual solo show and this year it has to be the vanilla coconut fragrance and taste of the gorse flower. The Cornish call gorse ‘Furzey’ probably due to its apparent fuzzy nature but picking the buds wasn’t so easy. A slow arduous process as the darn bushes have some nasty spikes. There is also a lot of folklore associated with it. The proverb ‘ Kissing is out of fashion when gorse is out of blossom’; it was often used as wedding decoration and if a sprig was tied to the door on May day, you could get a glass of milk and slice of bread as a gesture. I love painting gorse…..mixing cadmium yellows with paynes grey gives a beautiful warm greeny grey that is in the dark tangled undergrowth and with my loose spatter style, a myriad of yellow profuse and mix to make a dense yellow carpet to depict the gorse in full flower. I’ve been using just oil paints for a month. I’m not ditching the acrylics or inks, but wanted to grasp a feel for this new buttery greasy feeling paint with new techniques, experiments and stronger deeper paintings. But I have found I’m working just like I did with acrylics and inks. Am I meant to just use acrylics and inks as I can get the effect I want or will oils give me a new repetoire and more subtlety and depth to my work? I felt like I needed to see some great art for inspiration and when the invitation to Don’s cousins book launch in Dublin landed in my inbox, it felt like Dublin may be the perfect place to find it. Cheap flights, a cheapish (nowhere is cheap in Dublin) hotel with a great location so we could walk everywhere. we arrived with a list of the major art galleries and museums. Don spent a lot of his late teens and early twenties here, so it was a trip down memory lane for him. The major sites haven’t changed, but the city has grown and very much become a tourist destination now. The last time we both visited was eight years ago with Annie Kent. My memory of it for one short day, was of intense disappointment at the drab and grey of the city with very high brick buildings, so this time I went with no expectations. This time Temple Bar felt vibrant and colourful with some great eateries and the Grafton Street area still felt authentic. Dublin is easy to get around using the tram or on foot with several bridges crossing the Liffey. The National Gallery had incredible works on display and so varied for it’s timeline and style. Loved the modern portrait exhibition there and although not my thing, learnt from it. The highlight, The Irish Museum of Modern Art (IMMA) was quite a walk so I might suggest the tram to the nearest stop. It had fabulous gardens and changes exhibition frequently. The current exhibition of ‘Coast Lines’ featured several Cornish artists. Just to see the scale of work and get up close is always worth going in person. Art really feeds the soul. We also revisited Dublin City Gallery and worth a visit any time to see the permanent glass encased studio of Francis Bacon. Has to be seen to be believed! My story with Ithell began at the Virginia Woolf , Cornwall Inspired by her writing exhibition at the Tate , St Ives early 2018. An inspired exhibition of womens art from 1850 to modern day who are in some way inspired or connected by Woolf and her themes. Ithell’s painting ‘Stalacite 1962’ attracted me for it’s composition and at first was just a great painting of Nanjizal cave, but it was so much more. This excerpt is from the extensive website of Ithell Coloquhoun. “Colquhoun’s art is an art of transformation. She had an enduring preoccupation with transient states; those moments of instability when something is neither one thing nor the other but possesses qualities of both. Moments such as these occur in the natural world, the human world and the realm of the spirit. Volcanoes, caves, rock pools, wells and fountains are places that can be said to form a permeable interface between the surface of the physical world and the underworld and, symbolically, between the physical and the spiritual worlds. Deep stuff , but fascinating. Ithell was a great writer too and her books have recently been republished. ‘The living stones’ is her story of coming to Cornwall and her writings of the local area and traditions. It’s beautifully written and imagines of a time when Cornwall still had real character but modernisation was calling. The book made me want to know more and I discovered that she is quite revered down in Lamorna and especially in the mystical circles. There have been talks and exhibitions and her legacy lives on. She must have been one very special lady and followed her heart and her dreams and led a very creative life in all sorts of ways. Something I definately aspire too.